Two North Peaks is a hike that took fifteen hikers up Rocky Gap Road to the summit pass, climbed to North Peak Limestone via trail, lost elevation via a connecting ridge trail ending at North Peak Sandstone, dropped steeply back down to Rocky Gap Road, then finally, returned to the cars via the road. We filed into Red Rock Canyon NCA early this morning and parked off of the scenic loop at the Willow Springs picnic area. Climbing the 5 miles of Rocky Gap Road, we stayed together pretty well. Chris pointed out a couple of interesting spots along the way, including the junction of the North Peak Sandstone trail for our descent much later. Those 5 miles on the road took their toll and we needed a break at the summit. The morning started out with a stiff wind but, by the time we reached the top of the road, we were warmed up from the inside out. The trail from the road summit to North Peak Limestone is quite beautiful albeit arduous after the climb of 3000 elevation feet already accomplished. 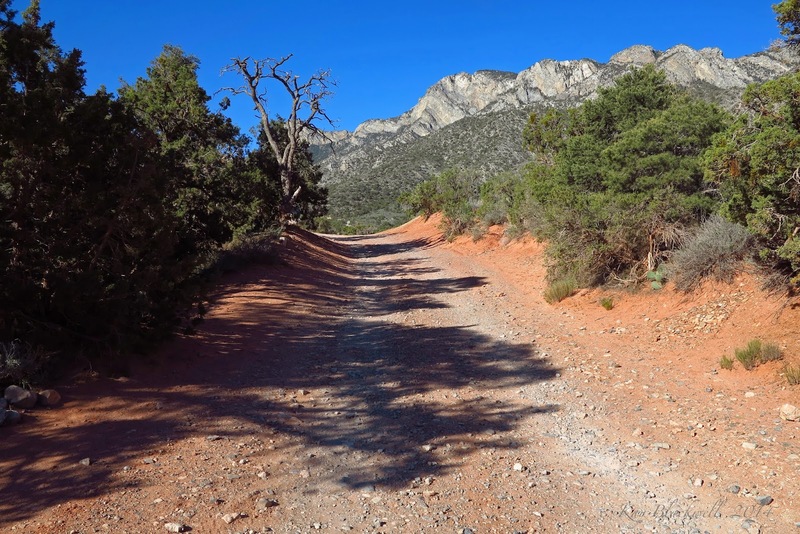 There are junipers, manzanita, pinyon pine and plenty of limestone rock outcroppings to complement the trail. Altitude becomes a bit of a factor at this point in the hike as we reached the 7000 foot level. Those with difficulty just slowed their pace a little to accommodate the small lack of oxygen. We gathered again at the North Peak trail junction and enjoyed the last quarter mile to the peak. Bridge Mountain came into view to our right as well as all the rest of the colorful sandstone on the top of the escarpment on our end. We didn't stay long on the peak. A quick bite. A quick log sign-in. A few quick photos and we were dropping down off of the end of the peak to reach the trail that follows the ridge to the sandstone beyond. The photo to the left shows the layout of this ridge ending at North Peak Sandstone. The ridge trail begins with a steep descent. 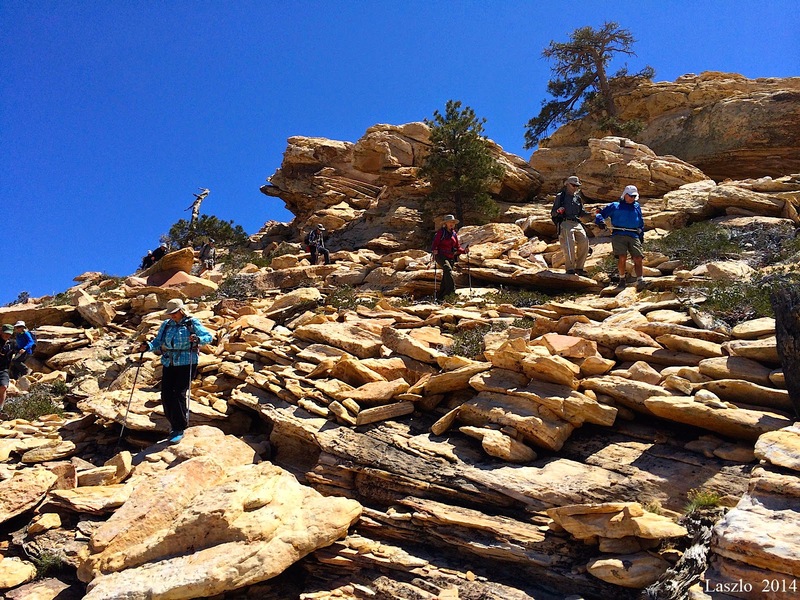 Although the ridge trail has its ups and downs, around 300 feet of elevation is lost between North Peak Limestone and the beginning of the sandstone underfoot. 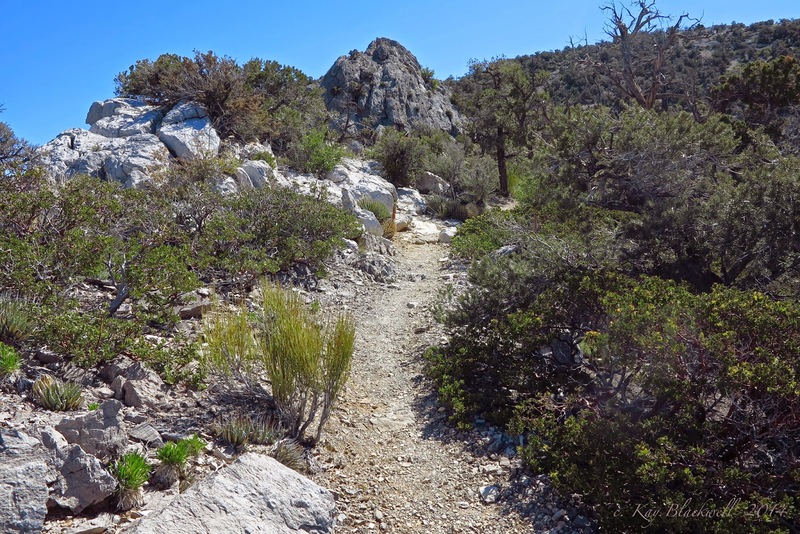 Most of the trail follows as close to the top of the ridge as possible with limestone rock outcroppings leading the way. Some of the limestone is embedded with fossils from the precambrian era but it is not predominant among the ridge. The outward views are colorful but the views of the ridge, itself, are most interesting as you hike along. 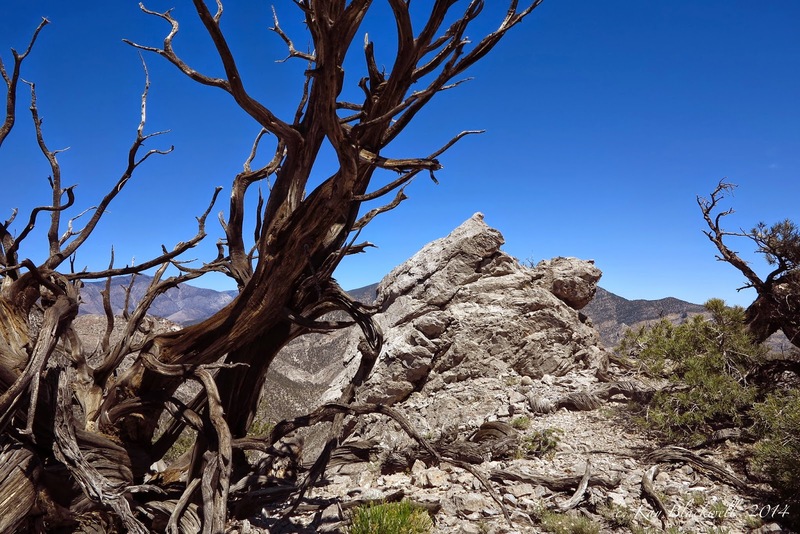 Limestone and old juniper trees never fail to intrigue the photographer! 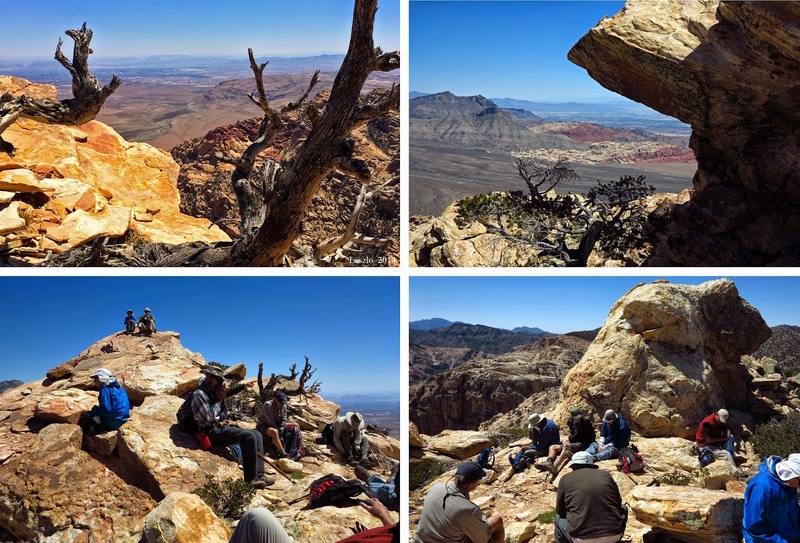 With the exception of a few faster hikers, the group stayed together on the ridge until we reached "Dragon Rock." If you view this rock from the correct angle, the rock appears to be a dragon with an open mouth. Beyond, Bridge Mountain can be seen through the "mouth!" Hitting the sandstone, we hiked another half mile over and up to the peak at the end of the ridge. 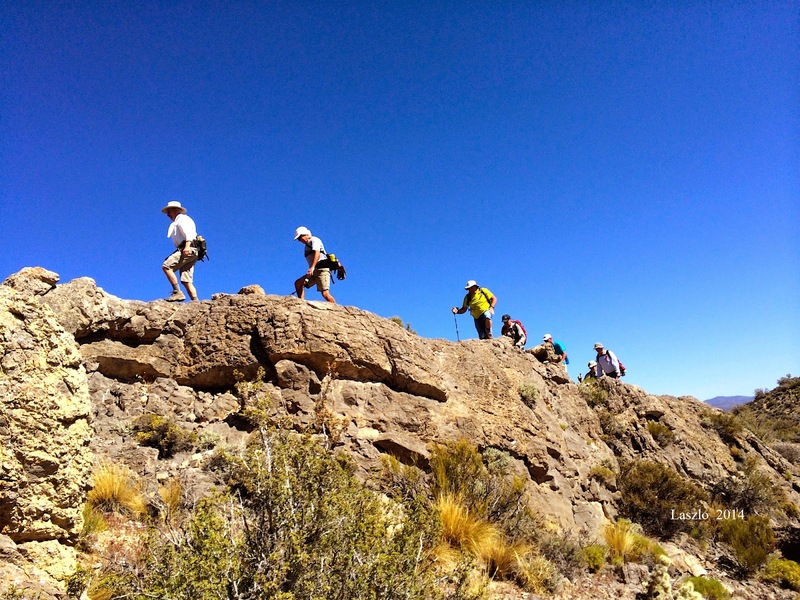 The loose sandstone slabs on the way to the peak were difficult for tired legs and feet. 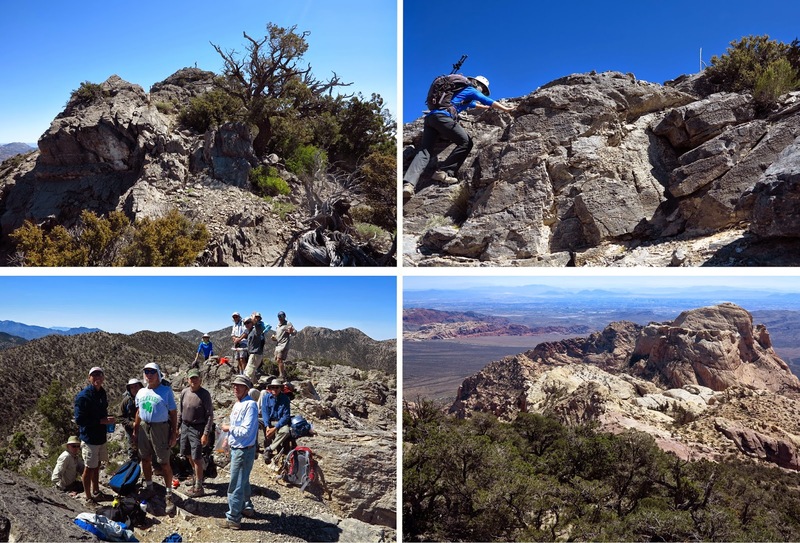 We took a longer break on North Peak Sandstone enjoying the colorful views around us of the Calico Hills and, again, Bridge Mountain. We all knew what was coming next and we were in no hurry to start the slip and slide descent. But first, we had to hike back over the sandstone almost all the way to Dragon Rock. 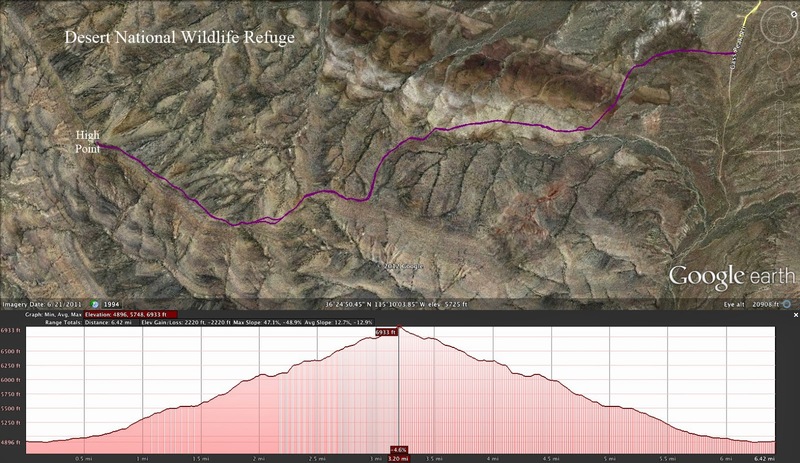 In this area, we began turning to the right catching the start of a long ridge that descended to Rocky Gap Road. A lot fewer photos were taken from this point on. We all commiserated on how many times each one of us had fallen on this particular section of trail that drops 1500 feet in elevation over a possible three quarters mile of space ... at most! It is a mean piece of trail! Today, the hill chose only two victims. All hikers survived to hike another day and when we got down to Rocky Gap Road, we took a break filled with relief. Just 2.5 miles to go. By the end of the hike, many of us were simply putting our feet out and hoping that they held our weight! Okay, it wasn't that bad ... but close! 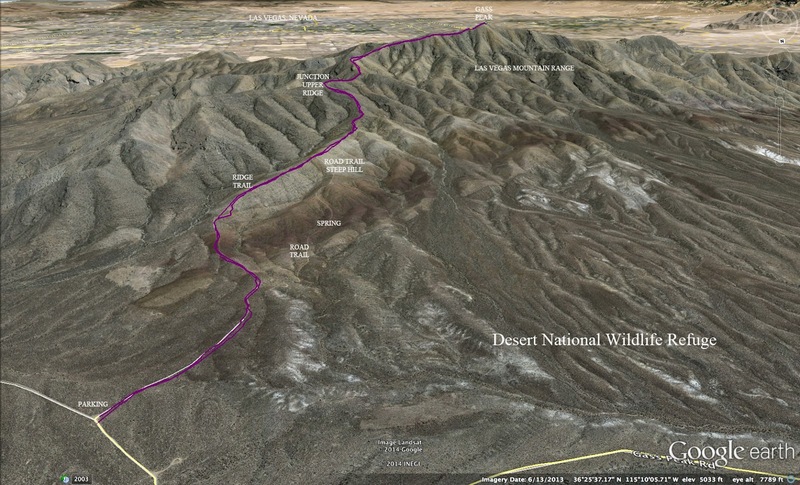 The indigo bushes were blooming like crazy along the Mormon Well Road as three high clearance vehicles carrying twelve hikers ambled out Corn Creek Road, Mormon Well Road and Gass Peak Road to reach the Gass Peak trailhead in the Desert National Wildlife Refuge. 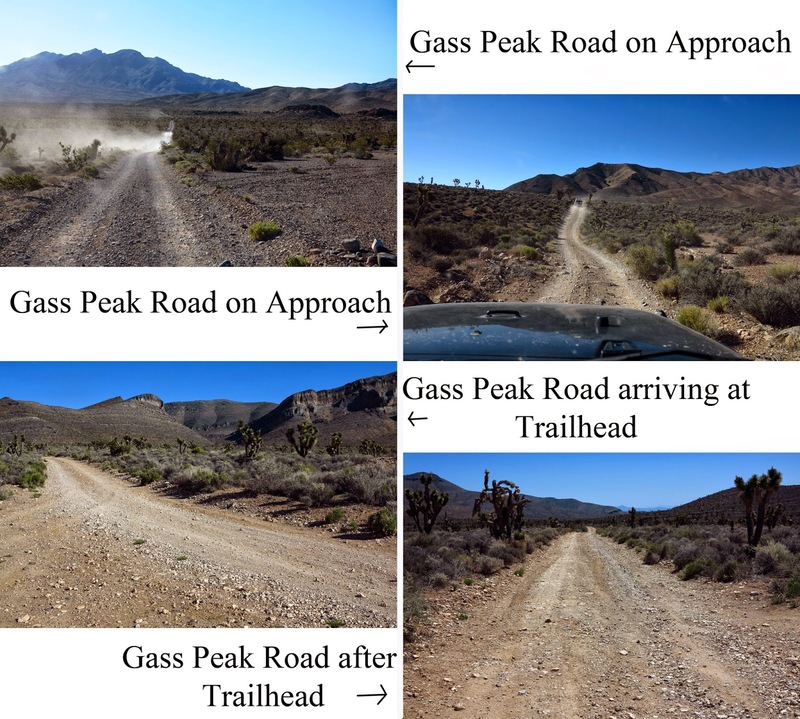 Gass Peak is the prominent mountain serving on the northern boundary of the Las Vegas alluvial fan. On a clear day, one can see the sun shining off of the solar panels residing on the peak from the city below. The roads were drivable but we did need our high clearance. The approximate time it took us from our meeting place to the Corn Creek Visitor Center restrooms to the Gass Peak trailhead was an hour. We stepped out of our cars ready to hike and the stint on the initial service road went by quickly. 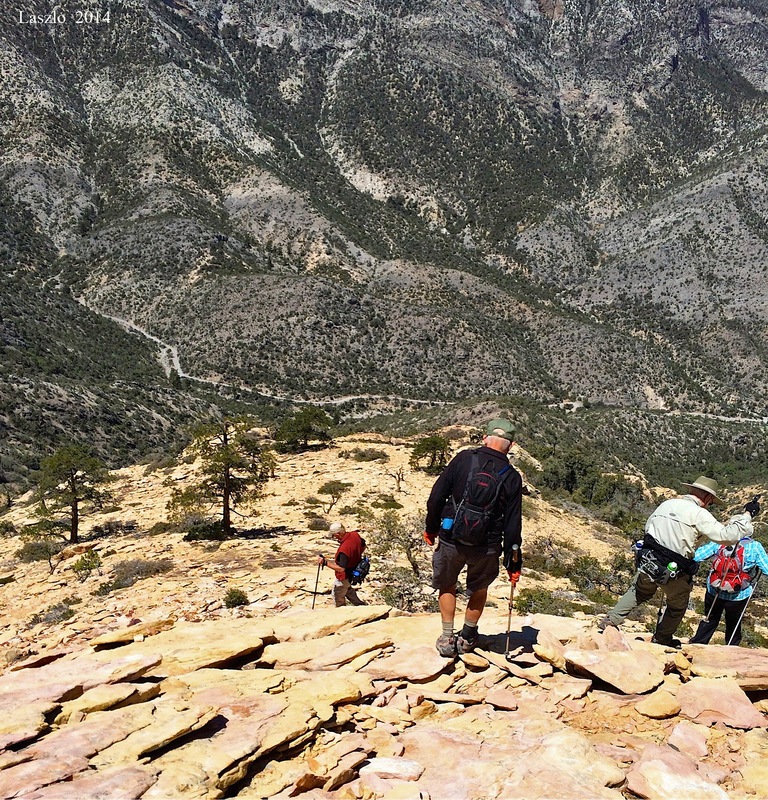 Soon enough, we were cutting up to the left onto the trail that leads hikers up the approach ridge. Another option for the approach would be to stay on the service road. 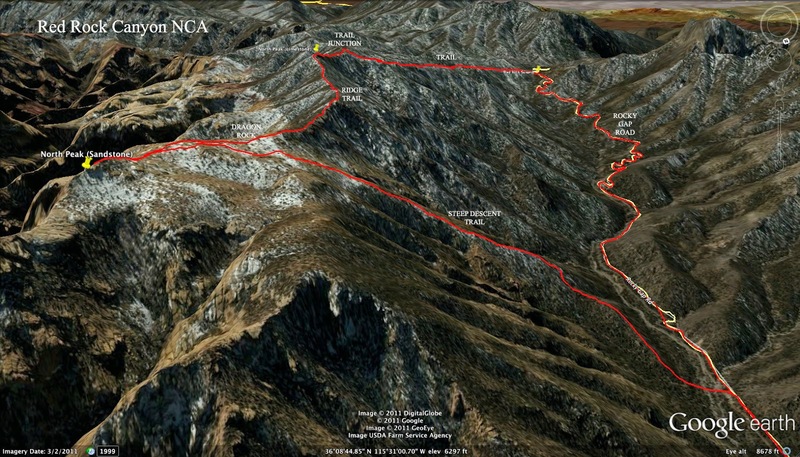 However, this requires a very steep climb up to the ridge trail in the end. (Somewhere along that part of the service road, there is Gass Spring.) Today, we chose the trail option and began a climb that leveled off every so often just when you really needed a breather. The views of the wildlife refuge are vast and comforting. On this side of Gass Peak, the visitor feels far away from civilization. Nature is the only course of the meal. Gass Peak rose up to our right and since we were climbing a ridge some distance from the peak, it never seemed to get any closer until we reached the upper ridge on which it sits. Even then, the peak stayed out of reach for a while. Our first view of the other side of the ridge held more mountains and valleys. 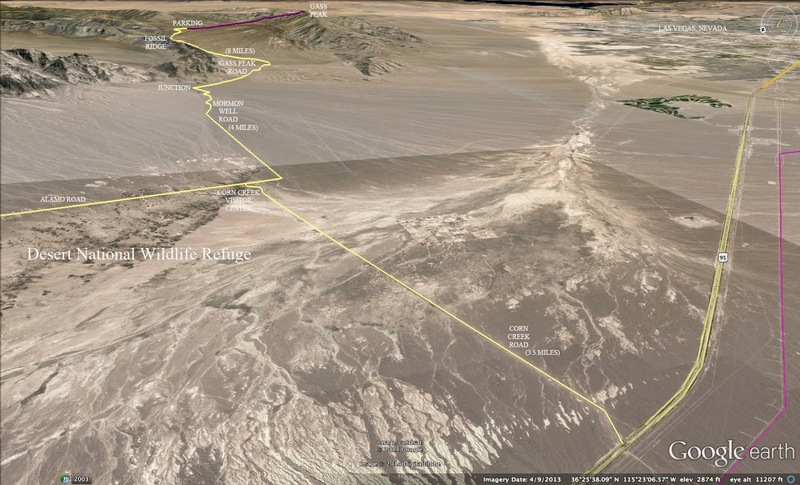 We saw that the upper ridge curved around to the left and right. Therefore, the city did not come into view until we were much closer to the peak. At first, the upper ridge trail seemed to be on a steady gentle climb. Then suddenly (!) two very nasty hills had to be met. They were separated by a small saddle but neither one of them cared to share its spotlight. In the photo above, the first hill is seen ascending up to the left. This one had a few small switchbacks. Later, the descent down this hill required constant concentration. Two of the saddles along the upper ridge allowed us to hike along raised chunks of limestone. 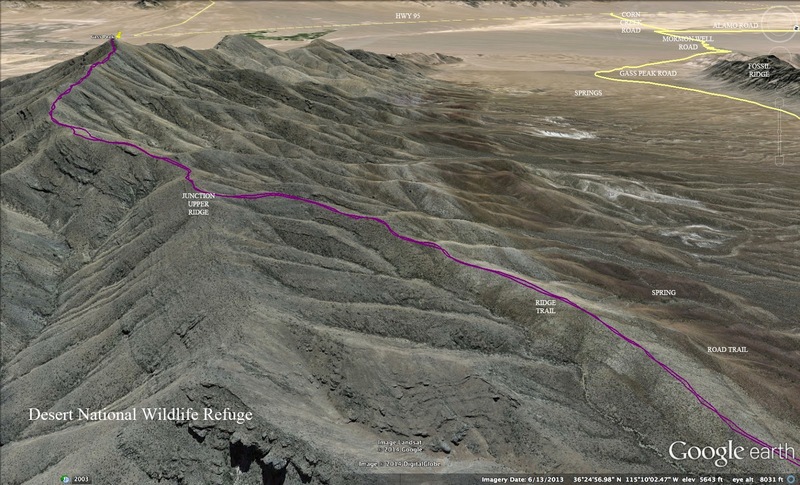 Like the Spring Mountains, the higher elevations in the wildlife refuge also were once part of an ancient seabed of the Pre-cambrian Era. At last, we reached the last saddle before the final climb to the peak. 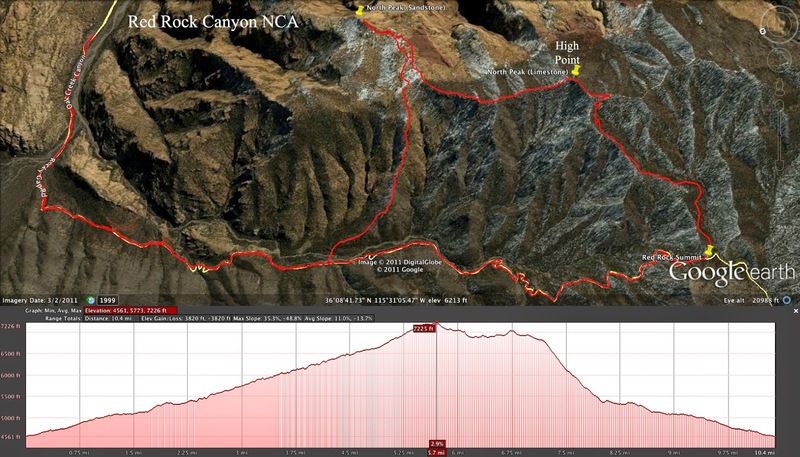 Compared to the previous two nasty hills, the peak climb was a piece of cake! The trail up to the peak is very clear (albeit a little random along the earlier lower ridge trail). Even though earlier hikers tended to prefer the final climb on the rocks to the right, the trail now follows at the base of the rocks and switchbacks at the solar panels. During this section of the climb, the writer saw this moss plant in bloom. It was the only one around! 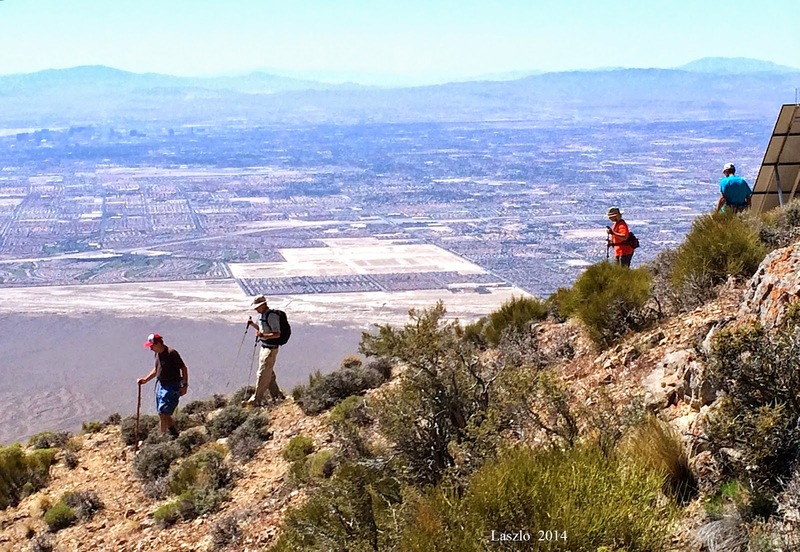 The Las Vegas Strip came into view at the second or third to the last saddle before the peak. When we arrived on the peak, we poked around the apparatus on top trying to make heads or tails of it. The cell tower and the solar panels were self-explanatory. But it amazed us how the windsock minus the "sock" was actually being moved by the light cool breeze. 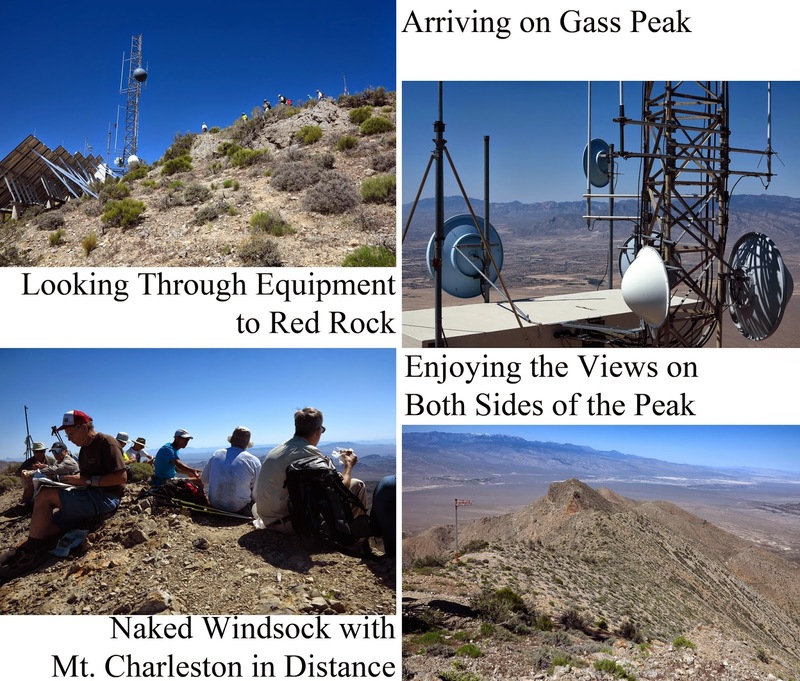 Gass Peak summit is long (around 40 feet) and narrow (around 8 feet). We each chose a side to sit on for our break. 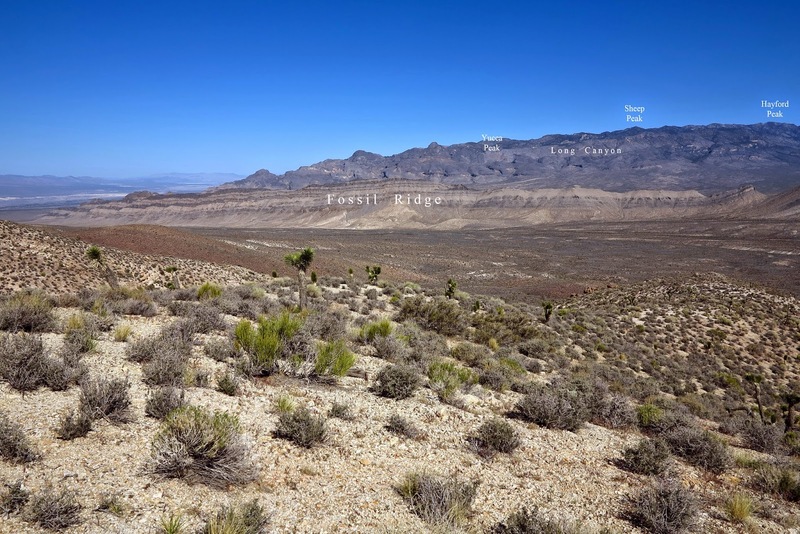 One side faced Las Vegas and the other side faced the wildlife refuge. 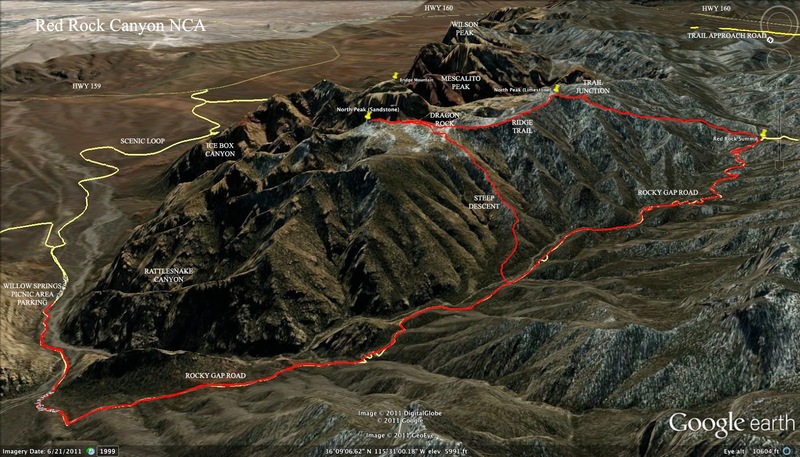 The far end of the peak pointed in the direction of the Spring Mountains and a snow-capped Mt. Charleston. We signed the log book and ate a snack. Too soon, we had to begin our descent. Two hiking sticks might be needed for this exercise! The descent down the upper ridge went quickly and the descent down the lower ridge trail went even quicker. All that was left was the service road then we faced the long beautiful drive back to the city.